Disk Bench will test your hard drive speed in a real life situation not in a benchmarking environment. All Disk Bench does is copies a file from A to B, times the time it took, and deletes the file from B again. The other way to benchmark is to choose Create File. This way it just creates a file (consisting of a repeated 128 byte string). 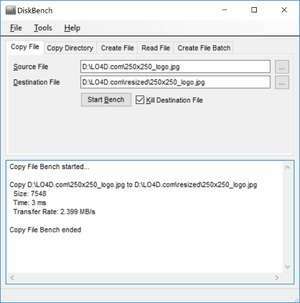 For security reasons, you should also check out the Disk Bench download at LO4D.com which includes virus and malware tests. Additional screenshots of this application download may be available, too.